Those who create fandoms are fans themselves after all! Here are references to Rinoa and company in other entertainment franchises. Half are Rinoa-specific; half relate to FFVIII in general. Love Hina is a harem manga series by Ken Akamatsu, who is a big Final Fantasy fan and shows it by putting in references to various games in his works. In Volume 3, Chapter 17, a simplified Squall and Rinoa are onlookers as the main characters Keitaro and Naru crash into a pile of boxes on the street. Squall and Rinoa are exiting a game arcade, and the boxes are filled with plushies that resemble Mokona (from Rayearth anime). It's a blink-and-you'll-miss-it cameo, but cute nonetheless. Then, in Volume 13, Chapter 111, the main female love interest, Naru, wears an outfit that is arguably inspired by Rinoa's basic outfit. It's a black dress with a light-colored, v-neck duster that ties with a bow in the front. Naru also wears a necklace and has her hair in a similar style as Tifa (Final Fantasy 7). In this chapter, Naru essentially "rescues" the main character and her love interest from a zany kidnapping. 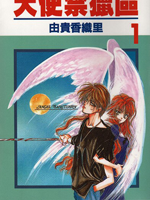 Angel Sanctuary is a fantasy manga series by Kaori Yuki, an illustrator and author known for her gothic art style. In one of the volumes of Angel Sanctuary, Ms. Yuki discusses her thoughts on Squall and Rinoa's relationship in a side column, according to FF Wikia. In Japanese manga, it's very common for mangakas to have a side bar for their notes and doodles every couple chapters or so. Sometimes they use this free space to reveal thoughts during the creative process or promote upcoming work. Other times, they can go off on tangents and talk about things that they like. While I don't know what the publishers' intent for these side bars are, but I think it's a nice way for readers to get to know personalities of the manga authors. I'm a huge fan of the Angel Sanctuary series, but there's a whopping 120 chapters, and I don't remember which one had her Final Fantasy VIII remarks in them. I'm in the process of re-reading the whole series, so I'll update this when I find out what Chapter and Volume contains Ms. Yuki's notes. In the 2004 Summer Olympics in Athens, Final Fantasy VIII's opening song, "Liberi Fatali," was used in a performance by the United State's women's team in Syncronized Swimming. It was used by the duet team of Alison Bartosik and Anna Kozlova for their Free [Choice] Routine. They received a technical merit score of 48.667 (out of 50) and an artistic impression score of 48.500. They won the Bronze Medal. Here is the video: USA Synchro Duet Free 2004. If this link no longer works, please search using the facts given above. Liberi Fatali was a surprisingly great choice for a synchronized swimming performance. It added a grand dramatic effect. It goes to show how masterful Uematsu's work is that it can be flexibly applied to things outside of the video game industry. Charlie's Angels was an American action-comedy film released in 2000. It was a reboot of the 1970s tv series of the same name. In one scene, where one of the main characters falls into a stranger's backyard, the kids inside are seen playing Final Fantasy VIII. Squall and Quistis are shown battling in Balamb Garden's Training Area. Here is a video link of the scene: Final Fantasy in Charlie's Angels. Have you seen a pop culture reference to Final Fantasy VIII that isn't on this list? Tell me about it.